I was thinking this morning....... about mosquitoes. Yes, mosquitoes. 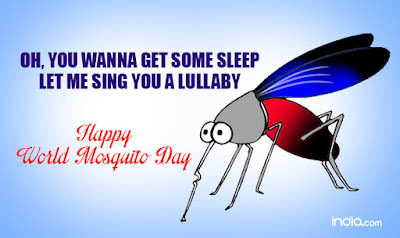 Not because I was badly bitten last night by mosquitoes, but because I found out that today 20th August is World Mosquito Day. Why will a day be dedicated to that tiny insect called mosquito when we do not have World Lion Day or World Elephant Day? Truly, I understand World Malaria Day, dedicated to the eradication of malaria, but can't understand World Mosquito Day, which I found out marks the historic discovery by British doctor and Nobel Prize winner Sir Ronald Ross that it is the female Anopheles mosquito that transmit malaria between humans. I unraveled that the wily mosquito has been stalking mankind for over 210 million years and tragically still kills a child every minute until very recently. 210 million years? Why are they obsessed with man? How did we offend these mosquitoes? As I thought about this, I recalled a funny Facebook post that says 'Women already have 3 to 5 days of losing blood every month. Can't mosquitoes be considerate and focus on men?' Hmm!!! Could that explain why it is only female mosquitoes that is involved in the blood sucking business? Are they making up for the blood their human counterparts lose? It may sound funny, but it is a food for thought. I was thinking, why is that these mosquitoes make a living by sucking the blood out of humans? If you study this characteristics very well, you will discover that these insects that are universally hated the world over are not alone in this business. Nice one Weyimi. I looked for your write up for 3 days now and concluded that you didn't write. Surprised, it just sprang up on my phone. This time na mosquitoes you face, the little blood sucking demons that kill humans more than any other animal. Pls next Sunday should be rats, rodents. Guess you know why, lol. It also the roommate of mosquitoes and the only thing that can chase Sai Baba from office. Hahahahaha. May God bless us all, amen.